Ages 3 & up. Good fairies and good wishes abound in this fantastic, magical scene. 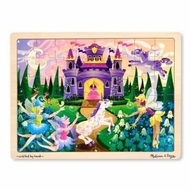 As a winged horse takes to the sky, a unicorn dances down the garden path and a princess awaits assembly! This wooden 48-piece jigsaw puzzle comes packaged in a sturdy, wooden tray for puzzle building and easy storage.